Round Table, 48" diameter 48” Round Tables, Seats 4-6 Guest High quality rental tables built Designed for Special Events / Catering Necessities. 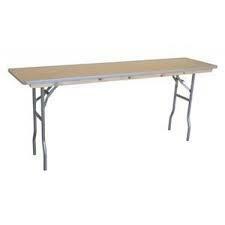 Perfect size for Banquet seating for guests, this table is the most commonly used. Suggested Linen: Lap -length 90”Round Tablecloth (15” Drop) 3/4 Length 108” Round Tablecloth (24” Drop) Floor Length 120” Round Tablecloth This table is perfect combination with your linen rentals and table chair rentals for all events. Great for wedding linen rentals in any color or fabric poly rental linen, satin linen, taffeta, crush taffeta and burlap linens is also a great option depending on the type of event and mood desired to set up. Round Table, 60" diameter 60” Round Tables, Seats 8-9 Guest High quality rental tables built Designed for Special Events / Catering Necessities. 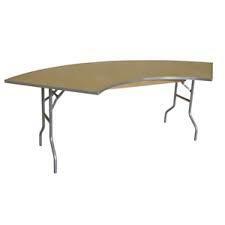 Perfect size for Banquet seating for guests, this table is the most commonly used. Suggested Linen: Lap -length 90”Round Tablecloth (15” Drop) 3/4 Length 108” Round Tablecloth (24” Drop) Floor Length 120” Round Tablecloth This table is perfect combination with your linen rentals and table chair rentals for all events. Let your guest enjoy a great party / guest that they would not forget for many years to come hosted by you. Great for wedding linen rentals in any color or fabric poly rental linen, satin linen, taffeta, crush taffeta and burlap linens is also a great option depending on the type of event and mood desired to set up. Rect. Table, 6' x 30"
Rect. Table, 8' x 30"
Rectangular Table, 8 x 30, 8 ft RectangularTables, Seats 8-10 Guest High quality rental tables built Designed for Special Events / Catering Necessities. Perfect size for Banquet seating for guests, this table is the most commonly used…Suggested Linen: Lap length 60” x 120”, Floor Length: 90” x 156”. Our table rentals are perfect for a huge variety of events from casual events to formal dinner weddings.. Lightweight material and portable design makes this table easy to transport and store. It can be used for outdoor events as well.. 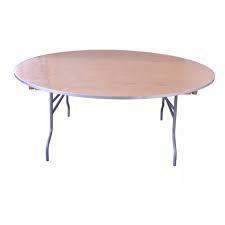 This table is perfect combination with your linen rentals and table chair rentals for all events. Let your guest enjoy a great party / guest that they would not forget for many years to come hosted by you. Great for wedding linen rentals in any color or fabric poly rental linen, satin linen, taffeta, crush taffeta and burlap linens is also a great option depending on the type of event and mood desired to set up. 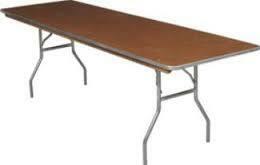 Plywood banquet table construction Commercial-grade, heavy duty 8-ply wood construction 3/4-in. thick wood top 4 coat lacquered wood surface finish Vinyl T-mold banding for a smooth, snag-free table edge Two hardwood battens, bolted through for added support and stacking protection 18 gauge steel frame 1-in. round steel legs . Round Table, 72" diameter 72” Round Tables, Seats 10-12 Guest High quality rental tables built Designed for Special Events / Catering Necessities. 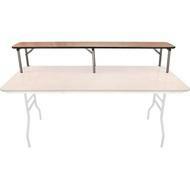 Perfect size for Banquet seating for guests, this table is the most commonly used. Suggested Linen: Lap -length 108”Round Tablecloth (15” Drop) 3/4 Length 120” Round Tablecloth (24” Drop) Floor Length 132” Round Tablecloth This table is perfect combination with your linen rentals and table chair rentals for all events. 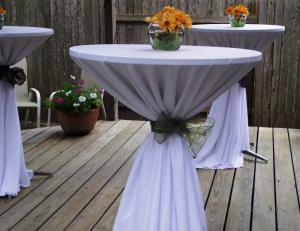 Let your guest enjoy a great party.. Great for wedding linen rentals. Ideal for rental. 30-in. round birchwood top with a quadruple coated polyurethane varnish. Smooth vinyl bullnose edge, for snag-free service. Shipped with both table height (30) and bar height (42") chrome finished aluminum columns. 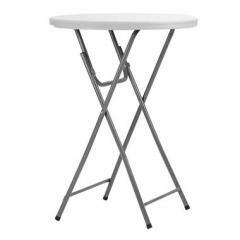 Stable, sturdy aluminum 4-prong star base with chrome finish. Self-leveling floor glides. 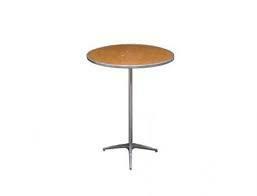 Both table top and bases included in price. 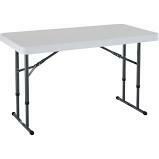 Rental grade, light weight, 32" round bar height plastic folding tables, grade bar height folding table with a static weight capacity of 220 lbs. 1.75" thick white granite plastic table top. Table top is impact and stain resistant. Gray powder coated cross legs with non-marring foot caps. High quality construction suite for indoor and outdoor use. Rect. Table, 4' x 24"
Seminar Table, 8' x 18"
Round Table, 60" diameter 60” Round Tables, Seats 8-9 Guest High quality rental tables built Designed for Special Events / Catering Necessities. Perfect size for Banquet seating for guests, this table is the most commonly used.. Our table rentals This seminar table has a slim design that is ideal for training seminars and workshops using table chair rentals . Compared to the 30” width of a standard banquet table, the seminar table has a narrow 18” width which provides just the right amount of table space for water glasses and notebooks—rather than a three course meal! Lightweight material and portable design makes this table easy to transport and store. It can be used for outdoor events as well..